Moovie night at the dairy flyer. 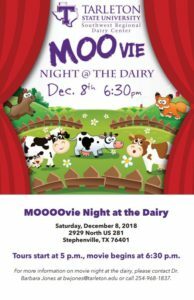 The Southwest Regional Dairy Center will host the first annual Moovie Night at the Dairy on Dec. 8. Tours of the Southwest Regional Dairy Center will kick-off the evening at 5 p.m. Attendees will get an up-close look at the milking operations along with several other tasks at the dairy. Each tour will last around 30 minutes. After the tours, guests will gather on the dairy center’s lawn to enjoy the featured movie, “Elf.” Visitors are encouraged to bring chairs and blankets. Dairy products like ice cream sandwiches will be distributed to audience members while supplies last. The event is sponsored by Southwest Dairy Farmers® and Dairy Max, Inc., and is free and open to everyone. Dr. Barbara Jones, assistant professor of animal science and veterinary technology, thought of the event as a way to create community outreach. “Part of our mission is community outreach. We are hoping to have more programs in the future like this one. I love doing community outreach. It is one of the perks of my job,” Jones said. The event will combine three things Jones said she loves — community, family time and the dairy industry. “I love to promote the dairy industry. It is something I have always been passionate about. Having events like this really promotes the industry in a positive light, and I also love family time. So, every time we can have family events at the farm, it’s a great time,” Jones said. The Southwest Regional Dairy Center also gives tours by appointment Monday through Friday from 8 a.m. to 5 p.m. The center can accommodate any group size. The best time to come is before 9:30 a.m. or after 1:30 p.m. The Southwest Regional Dairy Center is located on 2929 N. U.S. Highway 281 in Stephenville. 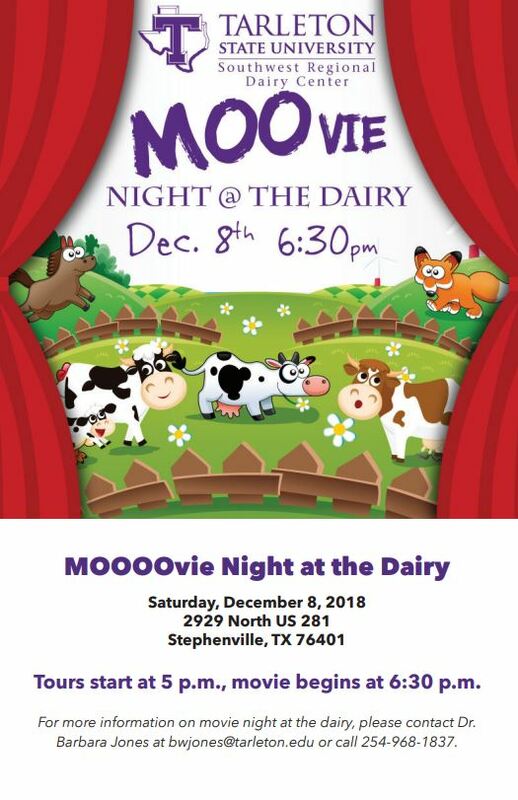 For more information about Moovie Night at the Dairy or touring the center, contact Jones at 254-968-1837 or bwjones@tarleton.edu.